To meet Britain's need for cargo capacity during the first world war, the Shipping Controller arranged for the construction of several types of "War Standard" ships. Gallic (II) was originally one of these, and one of three "G" type War Standard ships purchased by White Star after the war ended. (Bardic and Delphic were the others.) Built by Workman, Clark & Co., Belfast, she was launched as War Argus in December 1918 and placed under White Star's management upon completion. 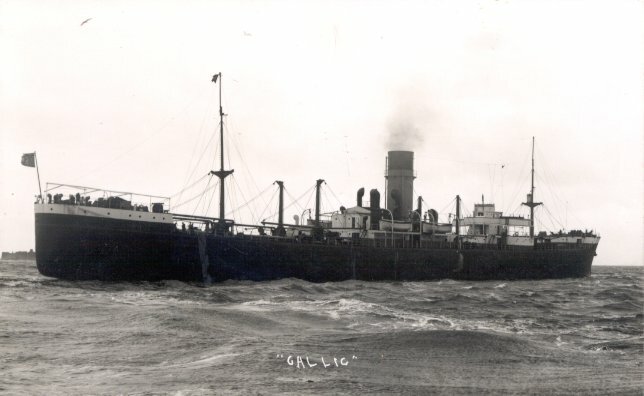 A cargo carrier with no passenger accommodations, War Argus was purchased by White Star from the Shipping Controller in August 1919 (according to Haws) or January 1920 (according to Anderson), renamed Gallic, and placed on the cargo service to Australia and New Zealand. After an uneventful White Star career, Gallic was sold to Clan Line Steamers, Inc., in 1933 and renamed Clan Colquhoun. She was later sold to Zarati Steamship Company (1947; renamed Ioannis Livanos), Dos Oceanos Cie. (1949; renamed Jenny); and Djakarta Lloyd (1951; renamed Imam Bondjol and, in 1952, Djatinegra). She was scrapped in Japan in 1956. Sources: Anderson's White Star; Haws' Merchant Fleets.